Do you have plans to make a big move for your business? Well, there are important things that you need to consider first before reaching a decision. Relocating your business is not an easy endeavour. It’s not a simple point A to point B process. Well, that’s the big idea. But before the transition, there are certain preparations that need to be taken care of. Milestones need to be completed. And contingencies need to be zeroed out or at least minimised. Hence, before you do anything, you need to make a plan. Although that part, shouldn’t be too hard. Fret not. Moving office Sydney will help you out, we have listed below the things that you’ll need to consider before deciding your office move. Read this 5 useful office removal tips to consider before you decide to move your business. Before taking any action on your relocation plan, ask yourself what reason made you relocate your business in the first place. Is it because your business is growing? And you’ve run out of space because of that? Or are you downsizing your business? Whatever reason it may be, this primary office removal tips will help you evaluate things for a better choice of decision. Always take it into consideration the reason for your move and it will help things work out for you as you move forward. The next thing you need to consider is how much will it cost to do the move. Will it work for you? If your business doesn’t have enough money stored to cover the whole relocation cost, then a move may not be possible for you. You need to consider not only the cost of office removal process but also the cost of having everything set up in the new location. Also, consider the downtime that will arise as you do the relocation. The longer the downtime happens the more loss of money in your business. So, consider working with a removal company that can make the whole process much quicker for your business. The most important office removal tips that you must not skip is getting to know more about the new location. Yes, this a crucial part that needs to be taken seriously. Check and evaluate if the new location you are about to relocate to will benefit your business. How sure are you that there is a strong market demand for your product or services in this new location? Is relocating to this new place a wise decision for you to make? With this in mind, you can conduct a market research about the new place you plan to move to. This will help you decide if moving is beneficial to you. When you have checked and reviewed the reason for your move, the cost it may cover, and the new location of your business plan. You can now start to plan and organise your office removal plan. You may ask assistance from experts. And prepare the things ahead of time. This will make your office relocation plan free from hassle and stress. Remember that planning your move ahead of time gives you the advantage to perform the relocation successfully. Once the above 4 useful office removal tips are considered, the last thing you need to do now is to cast the die. Decide your move and work with the best office removalists that will help you make things easy and successful. And as you have decided your moving target schedule, you might consider renting a commercial storage for items that you don’t want to get rid of and are still in good condition. With the above office removal tips, you will now have an idea of how important it is to take things into consideration before making any business relocation decision. Yes, office relocation may be a good decision for your business for it to grow. But without proper evaluation of the things you need to consider, it could cause you unexpected problems. Be prepared to deal with more unexpected challenges. Are you up with more office removal tips? Business Relocation Services is here to give you more. Call 1300 92 94 40 or you can check our website businessrelocationservices.com.au for more useful office removal related tips. Also, would you care for some hacks our experts came up with after doing so many office removal projects? 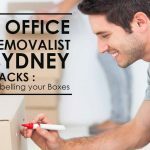 Then check out our article Office Removalist Sydney Hacks.